If you were among the visitors seeking a seat in the House of Representatives gallery that Sabbath day on February 12, 1865, you would have had to arrive early to accomplish your goal, for the gallery was packed with black and white individuals. It was a historical occasion in many aspects. First, the adoption of the 13th Amendment by the Congress banning the institution of slavery was within sight. Second, the decision of the Republican majority to commemorate the event by a public religious service was surprising, even in the middle of the nineteenth century of the republic. Next, President Abraham Lincoln’s choice of a speaker was the Rev. 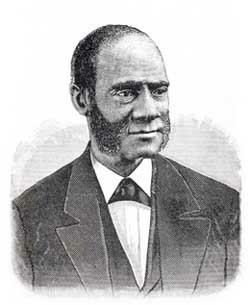 Henry Highland Garnet, a former slave and then pastor of the Fifteenth Street Presbyterian Church in Washington, D.C. Blacks had been barred from entrance to the halls of Congress in recent days before this event. Now this six foot abolitionist, even by political and, failing that, physical means, was being invited to lead the worship service in the House of Representatives. And it was a worship service. The memorable meeting began with the singing of the hymn, “All Hail the Power of Jesus Name.” That was followed up with a Scripture reading. The choir from the Fifteenth Street Presbyterian Church sang “Arise My Soul Arise, Shake off Thy Guilty Fears.” Then Rev. Garnet began to preach, following the text of Matthew 23:4, which describes the Pharisees of our Lord’s day “For they bind heavy burdens and grievous to be borne, and lay them on men’s shoulders, but they themselves will not move them with one of their fingers.” The title of his hour-long message was “Let the Monster Perish.” He would spare no words in the powerful address. The entire message can be found on Google for readers to read, but those who heard it that day went away, certainly having their curiosity satisfied. And whether we agree with his verbiage or not, what a memorable way to celebrate the passage of legislation than a worship service in the Congress. Would to God that we would have political representatives who would desire to hear God’s Word and not worry about whether it was a violation of the separation of church and state!